Just after dark, we set off our pyrotechnics. A motley assortment of fountains and tubes and fizzers. We bought the pack at a Target, in Destin, FL. The kids have been counting down the days until we could fire them up. The night finally came and it was good times while it lasted. The kids would each pick out a item. Liam put his selection on the launching pad (a tmetal trashcan lid.) Meg wanted me to place hers.I'd light the fuzes. Then Liam and I would run for cover. In between oooh's and aaah's, Cindy would inject her particular brand of insanity with dire predictions and unfounded warnings. 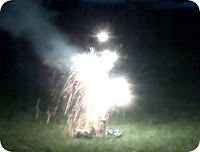 The first batch of fireworks was mostly flash and spark. Very little in the way of pops or explosions. I guess it is a kinder, gentler generation these days. The two biggest tubes shot up geyers of sparks, like flaming volcanoes. The second little batch surprised me. Half a dozen solid marbles with a fuse dangling out of them. I'd put them on the driveway, light them and jump back. They would ignite and then do the most amazingly bright and sputtering strobe effect I've ever seen. So bright that Cindy couldn't look at it. And I couldn't see the ball spinning in the middle until the glare died out and the smoldering ember was left behind, turning in an ever slowing circle. We wrapped up and the kids sang Happy Birth to America. A quiet, peaceful way to end a long week.